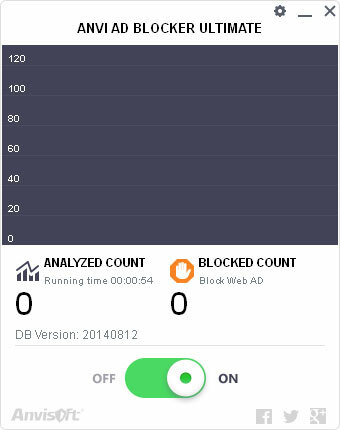 With brand-new and users-friendly interface and a powerful database, Anvi AD Blocker Ultimate is capable of analyzing and blocking most of the browser related ads, including search links, text links, video, product comparisons and reviews, coupons, graphics or banners, or other interactive content displayed through your browser. Anvi AD Blocker Ultimate will give you a free and light surfing experience, and prevent you from falling into Internet scam and online threats. Anvi AD Blocker Ultimate is Internet Explorer, Mozilla Firefox, Google Chrome Supported. Once the pattern of “real-time block” turned on, Anvi AD Blocker Ultimate will automatically analyzes your web content based on its huge and constantly updated database in real time. You can turn on this feature to block ads at any time you want. The Blocked Ads Logs of Anvi AD Blocker Ultimate provides user with daily blocked ads information. Simply click on the number of the blocked count to check what ads have been blocked. You can change your software skin colors between white and black, automatically set the patterns between day and night. Every time you start the free version of Anvi AD Blocker Ultimate, you can block 50 ads for free. Block ads from all of the popular websites more efficient and flexible without modifying the original website structure. Right click on the Tray Icon of AD Blocker Ultimate, you can easily view the how many ads blocked, get access to main interface, go to settings center, check the license information and check the blocked ads log.